We began in the small village of Volcano. Located on the Old Volcano Road, right outside of the Volcano's National Park. We opened our first inspirational getaway on July 4, 1995. Every year we celebrate our anniversary with a big 20% off sale and our Annual Quilt Challenge (keep an eye out for details). In our shop we sell Hawaiian quilts, fabric, quilt patterns, and notions. We also carry an array of Hawaiian local arts and crafts. It truly is a wonderful place to visit with wonderful people waiting to meet you! 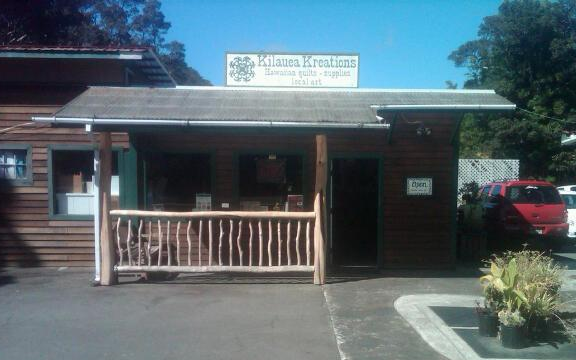 You can find us in Volcano Village, next to Kilauea General Store and Lava Rock Cafe. Now we didn't stop there! We opened our second shop in April of 2007 on Manono street in Hilo town, right down the road from the famous Big Island Candies. Here we are welcomed with a splash of color every day; a second place of inspiration! We carry a majority of fabric, as well as your quilting patterns and supplies. We also were inspired to open our shop in Hilo to hold quilting classes there, which we have regularly We hold classes of all styles and levels. Please check out our class page to see and sign up for our up and coming classes! We are located several houses down from the Kekuanaoa St and Manono St intersection, heading toward the ocean. Look for a little blue house with a quilt or two hanging outside.